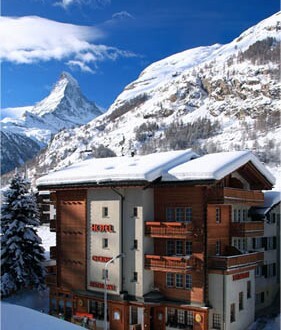 The hotel is perfectly situated, directly opposite the Sunnegga Express lift station. Start your day in the Alps with a large and varied Swiss breakfast buffet, available from 7.30 a.m. until 10.00 a.m.
After a hard day of hiking amongst the 4,000 meter Swiss alpine peaks or exploring one of the largest ski areas in the world, sit back and enjoy a drink or two in our cosy and spacious bar and allow yourself to reminisce your day. Our well known restaurant and steakhouse serves fresh local produce and high quality cuisine. Enjoy delicious appetizers, a wide selection of steaks from the barbecue grill and last but not least a large variety of Swiss specialties.